Back 2 Basic is a 501c3 non-partisan, nonprofit organization that works with companies, charities, and individuals to make giving simpler, efficient, and effective. Managed by Good360, the leader in product philanthropy, Back 2 Basic offers new non-perishables and home product donations to other non-profit organizations in Southern Nevada. Back 2 Basic Changes lives and strengthens communities by mobilizing companies to donate goods to fill the needs that other non-profits are not able to fill. Back 2 Basic offers new nonperishable and home product donations to other non-profit organizations through a partnership with local companies managed by Good360. Families and individuals faced with economic challenges and limited income are assisted through our vendors and partners. In 2016, we connected with over 100 Non-profit organizations. Back 2 Basic has redistributed $650,000 worth of non-perishable items in 2016. A single truckload purchased by Back 2 Basic serves over 1,400 families and over 3,600 individuals. When you donate toward a truck-load you will help us to expand the quarterly community events where we pass out non-perishable items through our various programs. 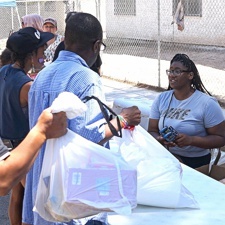 Directly impact your community by distributing goods that you purchase from us. Back 2 Basic’s goal is to impact our community and assist you with yours. Truckloads can be purchased from $500 and up that will come with a variety of nonperishable items to reach the needs of the people in your community that we can’t see. Back 2 Basic has quarterly community events and we need more volunteers to help this impact we make in rural areas. Contact us to see how you can help with the next upcoming event. Pastor Tapplin is a charismatic leader, entrepreneur, and provocative thinker. Pastor Tapplin has served over 20 years in Air Force retiring in 2001 from the military to join Gods army full time. Beyond the pulpit, Pastor Tapplin loves reaching the lost from the convalescing homes, to feeding the homeless. This inspirited Pastor Tapplin and his wife of 20 years , to open Back 2 Basic Community Distribution Center. Back to Basic & Global Outreach Ministries is a 501(c3) non-profit organization.